ANNOUNCEMENT – YSS Bulletin #2 released! For example, did you know that this Saturday (30 May) is the final deadline for our Young Statisticians Writing Competition – and that we’ve also recently unveiled the 2015 RSS Statistical Analytics Challenge, a team-based analytics competition developed in conjunction with the RSS Research Section? 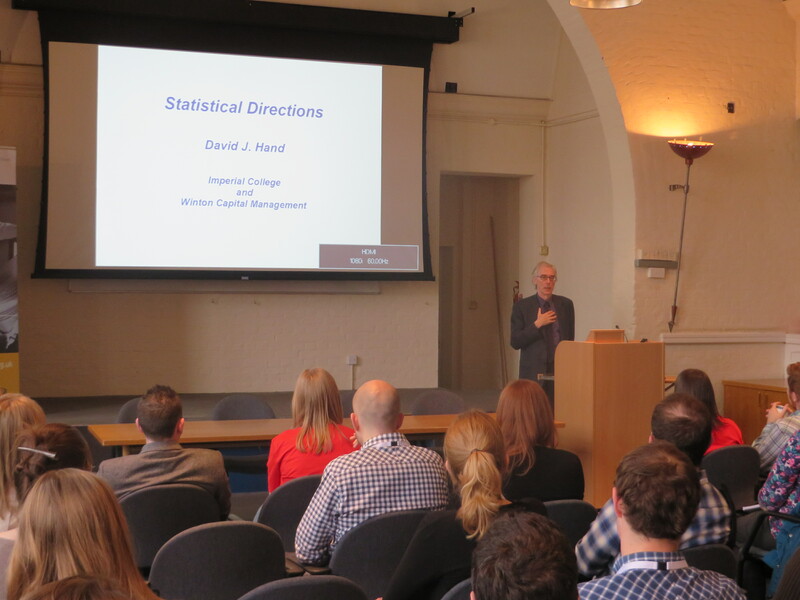 The 2015 edition of the annual YSS Statistical Showcase was held in the traditional venue of RSS headquarters, Errol Street, London on Friday 17 April 2015. With brand new audio-visual equipment installed in the main lecture theatre only one day earlier, the potential for technical gremlins to cause havoc was high, but luckily the new system behaved itself throughout the day, and the event – now one of the longest-running fixtures in the YSS calendar – ran as smoothly as ever. The Showcase was opened by organiser Lisa McCrink (YSS Meetings Secretary) and Tim Paulden (YSS Chair) who spoke about who the YSS are and what we do, including the current YSS/Significance Young Statisticians Writing Competition (see here for details), the upcoming RSS Conference in Exeter (September 2015), and the new RSS e-membership now available free for students. In total, 47 delegates came from all over the UK (including Northern Ireland) looking for statistical inspiration from 16 enthusiastic speakers – some starting out in their statistical careers, others with years of experience behind them – across two parallel-running streams consisting of three sessions each: Sports / Technology; Government & Consultancy / Environment; and Medical / Finance. Companies and institutions represented at the event included Allstate, ATASS Sports, Cancer Research UK, Experian, Google (DeepMind & Advertisements), GSI, Lubrizol, Mango Solutions, NHS Blood and Transplant, Quintessa, Roche, Shell, Sony, Sport Radar and University of Leeds. The afternoon was generously sponsored by DataTech, Lubrizol, Sparx and Winton. Throughout the afternoon, we learned how amazing it is to work for Google (no, really it is! ), how sports models can be used to detect match fixing, how statistical modelling can be applied to cracked bricks in energy reactors and to develop new chemical technologies and engines… and much more. And we’re now all addicted to Cancer Research UK’s Apple and Android app ‘Reverse the Odds’ – designed as part of the Citizen Science initiative – involving statistical data gathered from the public in cancer awareness analyses. The proceedings were brought to a close with a fascinating and motivating keynote presentation from Professor David Hand, former RSS president and Guy Medal Winner. Professor Hand entertained his audience with tales of academic life, setting up his own consultancy business, the pressure of being an expert witness in a court case of fraud, and his passion for writing which has resulted in over 20 books to his name, including “The Improbability Principle”. Professor Hand also provided invaluable advice to career-young statisticians during the Q&A session, ranging from the desirable qualities required to be a successful statistician to finding motivation as a doctoral student completing a thesis in Statistics. The post-event networking wine reception was kindly sponsored by Sparx, who reminded us that only a small proportion of students leave school with a good maths qualification, and that providing quality teaching of maths and statistics within schools should therefore be a key priority for society. This message summed up one of the underlying messages from the Showcase: that all of us who attended the event are very fortunate to have had a good statistical education which has opened the door to so many opportunities across such a wide range of fields and industries. And whether we are lucky enough to find the role we love early in our statistical lives, or, like Professor Hand, try out several statistical avenues to explore where our true passion lies, with a statistical qualification we will never be short of job opportunities. If you are interested in organising a statistical showcase within your company or institution, or simply finding out more, please get in touch with us on youngstatisticiansection@googlemail.com for ideas and a cheat sheet! 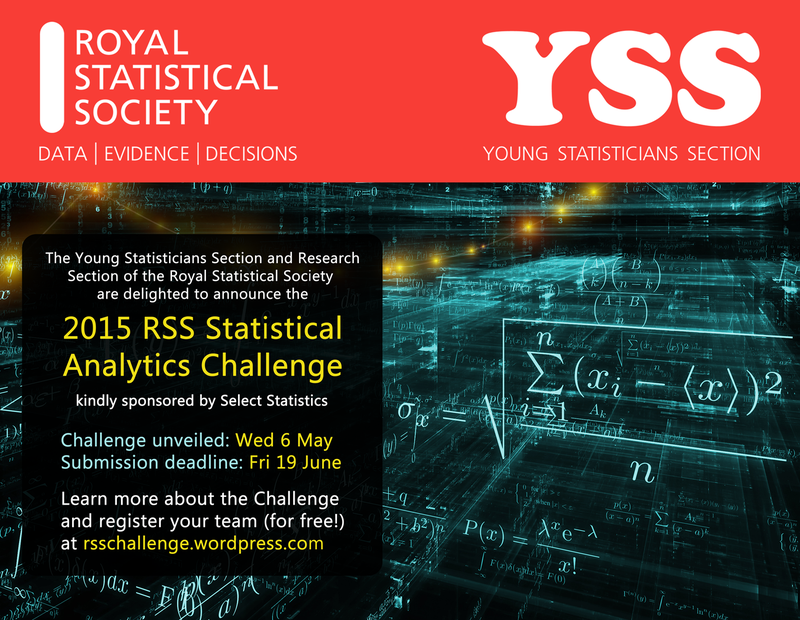 The 2015 RSS Statistical Analytics Challenge will be unveiled on Wed 6 May 2015!